quarrygirl.com » Blog Archive » update: you NEED TO GO to madeleine bistro this weekend. update: you NEED TO GO to madeleine bistro this weekend. okay, so i know i already posted the menu for this week’s chef tasting menu at madeleine bistro…but i had a chance to actually try out a few of the 5 courses today, and WHOA, this stuff is not to be believed. i don’t know what you have planned tonight and tomorrow, but you should seriously work in a visit to madeleine. this stuff is mind-blowing, even by dave anderson standards. oh, and i just wanna mention that the 5 course tasting menu is ONLY $50 (a steal), but each dish is also available a la carte for a lower price! the first thing i tried was the “egg” in the hole, a vegan take on the breakfast classic. nothing could prepare me for how good this thing was. it came with a soy-based egg stuffed in a piece of fried bread with portobella bacon and hash brown style rice balls, all of which were divine. this was seriously food art at it’s finest, and one of the most special things i’ve ever eaten at madeleine bistro…which is saying a lot. the soft fluffy egg was extremely convincing, it was hard to believe it was vegan. honestly, it was shockingly good, and i wish it was a regular menu item. next i tried the gnocci with summer vegetables, which was superb as well. 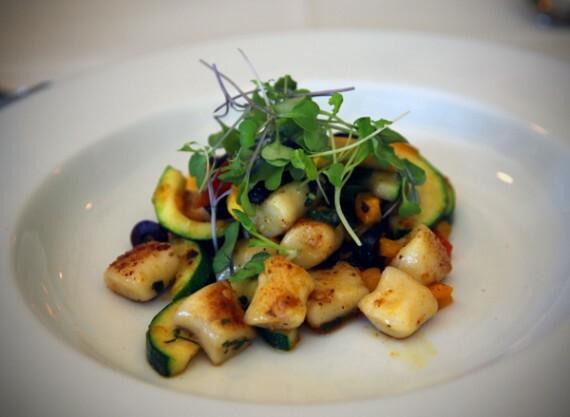 the vegetables were light and perfectly seasoned…and the gnocchi basically melted in my mouth. pure amazingness. lastly i had the heirloom tomato “garden,” yet another food work of art. this thing came with a variety of fresh heirloom tomatoes, complete with mushroom “soil” and little sprouts coming out of it—just like a garden!! so cute! there was a delicious chunky bruschetta mixture topped homemade tomato sorbet, which was one of the craziest things i’ve ever eaten. so refreshing, and perfect for this hot weather. i didn’t even get to try the other two courses, and i can already say that this is the most epic madeleine bistro tasting menu i’ve ever encountered. 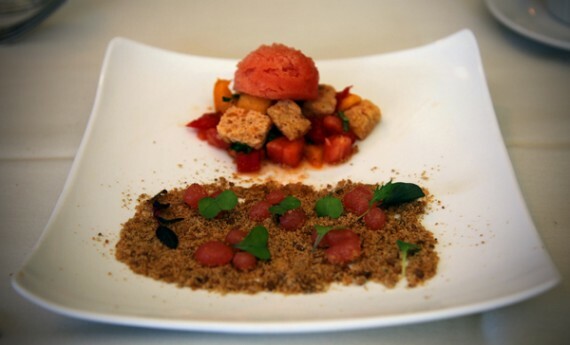 chef dave is really pushing things to the next level with the tomato sorbet and faux egg. you really must go try these things at madeleine this weekend…they are the kind of unique dishes i will remember for years to come. this menu is only available tonight and tomorrow evening for dinner…so act fast and get yo self to madeleine bistro! CHECK THE MENU HERE (also available a la carte)! I am going there tonight! Thanks QG for the tip. I went last night with my brother and can add that the final two items on the tasting menu are also phenomenal. The Hoisin-glazed tofu napoleon is unlike anything I’ve ever had- it’s best if you get a bit of everything on the plate into one bite. The lemon tart was also phenomenal. I’m still thinking about the heirloom tomato salad though-that was seriously a masterpiece. Don’t miss out!! These sound like some amazing vegan dishes!! 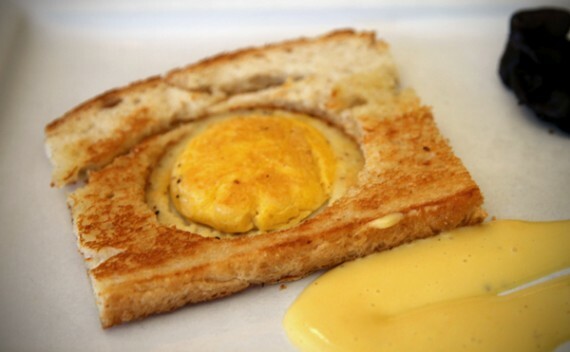 Egg in a hole?! WTF?! dang. i heard a rumor they’re looking to move to the west side of LA. @EricM …opening another location – OK, but moving!? F that! Stay in the valley, Madeleine!!!!!!!!!!!!! This blog is doing nothing to help my mad pregnancy cravings. That sounds soooooo yummy!! They would be way more successful in LA Proper. The valley is a wasteland. We went Saturday night. It was ridiculous! The ‘egg’ in a hole and the tomato salad were the two best vegan meals I’ve ever had (and I’ve been to Madeleine’s tons of times). Dave is my hero! I wish we had one here in Pittsburgh. The best I can hope for is to try and recreate what I see here. I think the first thing I will try is the gnocchi, since I have many zucchini sitting around needing to be cooked! Although the portobello bacon is intriguing. I am guessing I will have to dehydrate it; I love using my dehydrator!